Windmill Homes delivers what the savvy new homebuyer is seeking: high design, high quality, and a high level of personalization in prime locations across Northern Colorado. Before hiring the team at Diggles Creative, the biggest challenge faced by decision makers at Windmill Homes was finding a creative marketing partner with the expertise and flexibility necessary to deliver on multiple fronts. Windmill Homes needed a firm that could do it all: build a professional website, develop effective communication strategies which would resonate with their target audience, create brand-strengthening marketing campaigns, and, perhaps most importantly, be available in the years to come for ongoing assignments and challenges as the company continued to grow. Diggles Creative was able to meet and exceed all of these expectations. Read on to see how we did it—and how Windmill Homes has since doubled their growth in the meantime, now building over 100 new homes per year. The homepage is designed to be simple. It is obvious who Windmill Homes is, what they do, and where their communities are located. Answering these basic questions right away makes it easy for people to click through for more information. It can be difficult to organize website content for multiple communities. The Windmill Homes site uses secondary menus within each community section, making navigation simple and information easy to find. The floor plan section is the most popular area of the site. People can search for a plan by community, bedrooms, bathrooms, and style. When they find a floor plan they like, they can look through an image gallery and download a PDF brochure. An interactive map was added to the site to help new homebuyers choose their community, see pictures of model homes, see what floor plans are available, and get driving directions. Many builders like to brand each of their new developments, and Windmill Homes is no exception. Generally, they like to include a logo, color palette, font choice, and site plan in the brand guide for each of their communities. When Windmill Homes needs signage, t-shirts, brochures, or other marketing collateral, they can send their brand guide to vendors ensuring consistency between all of their graphics. Customer Experience—We helped Windmill Homes communicate how easy it is to buy a home from them by focusing their website on three areas that matter the most to new homebuyers. Finding a community they want to live in. Looking through floor plans to find a layout they like. Finding a salesperson to help them through the purchasing process. Content Creation—Previously, like many builders, Windmill Homes used engineering drawings for their community site plans. Engineering drawings are highly technical and difficult to comprehend. Their new site plans are easy for new homebuyers to understand and provide the sales team with a powerful tool. Closing Sales—The community site plans are available online and also displayed in the design center for in-person meetings. 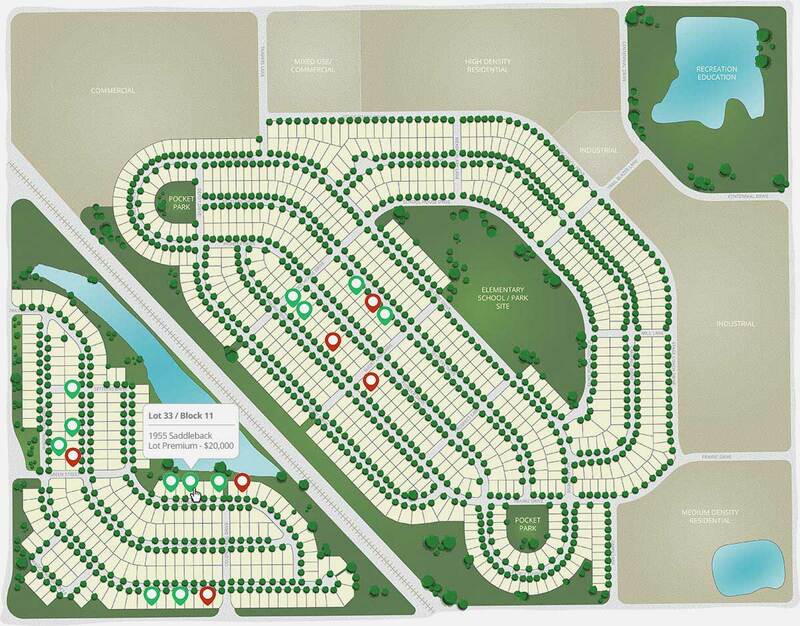 People get a quick overview of each community and can hover over available lots to see pricing details. Click the image of the site plan to see what it looked like before. Windmill Homes recognizes the need for quality pictures. They know that great images attract customers and help sell homes. It's that simple. The website is clean, easy to use, and day-to-day updates can be done by internal staff. Windmill Homes has a long-term partner that helps them keep their marketing looking great and up to date as they grow. Windmill Homes has doubled their growth two years in a row, now building 200+ homes per year.